Read through our Kids Carnival birthday party ideas and incorporate the best birthday party ideas into your party. Check out our cool Kids Carnival birthday party ideas for invitations. Blow up a balloon, write the party information on it, let the air out, put it in a envelope and mail it. It's a good idea to include a note in the envelopes telling invites to blow up the balloon. Design the invitations to look like a ticket (do this with your computer) to a circus or a carnival. Print the tickets out in different colours and put glitter on them. Use a photo of a clown (download it from the internet) and use it as a postcard. Write the party information on the back of the card. Decorate the clown with some gold, red, silver glitter. "Clowns, balloons and games are on the list for fun hurry on over cause the CARNIVAL has begun! Join us to celebrate Anna's eight birthday! "Date & time" until "time" at "address". To RSVP please call "phone nr" by "date". "Come and join the fun... This carnival party will be the best one! To RSVP please call "phone nr" by "date"." The kids don't have to dress up. But when they arrive to the Carnival birthday party let them be transformed to clowns. Give the children clown noses, party hats and paint their hair with different hair spray colour. Pick the Carnival birthday party decorations ideas you like the most, depending if your party is outdoors or indoors. Rent a local park with a big pavilion, if you want something extra. Decorate the party area with lots of colourful balloons and streamers. Blow up balloons every were, blue, yellow, red and green. Some can be fastened to sticks stuck in the ground to mark the path to the front door. Decorate the entrance with Balloon trees. Make balloon trees that are about 5ft tall and place them in the entrance for people to go through. If the party is indoors hang lots of streamers and circus posters. 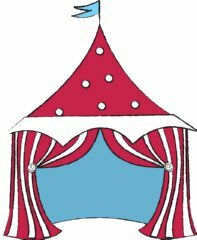 Create a Big top, by using a kids tent. For a indoors party, use colour full swag of crepe paper streamers in the party room. Have a clown hold the balloons at the entrance of the party or tent and give each child a balloon. Make a clown face out of cardboard, cut, paint and glue a clown wig around the head. Make a big face by using an overhead projector. Then take a picture of each child behind the face, (use these pictures as thank you cards later). Also, make animals (with the overhead projector), paint them and put them all over the party. Cotton candy machine - rent a cotton candy machine. Snow cone machine - rent a snow cone machine. Pop corn machine - rent a pop corn machine. Lollipop tree - make a lollipop tree or other candy trees. Ticket booth - made out of a big cardboard box, cut and paint. Use a red table cloth and decorate the table with colourful streamers and confetti. Use green, yellow and blue coloured table ware or use plates, cups with clown images on them. For centrepiece have a bouquet of balloons. If the party is outdoors set up a refreshment stand. We have awesome Kids Carnival birthday party ideas for games and activities, just look below. Pick the activities & games who fits your party best, depending if the party is indoors or outdoors. Have prices ready for each game - candy is best. Face painting is so much fun and kids love to be face painted. Let bath time ducks float in a very small pool. Each duck has a number on the bottom. The kids pick a duck and the numbers correspond to how much candy they get. Fill up soda bottles with colour rice, placed sticky foam shapes on them. Then using swimming rings let the kids try to ring a soda bottle. As many the kids are able to ring, that's how many candies they get. Make a big face of a clown using a overhead projector and cardboard. Cut, paint on clowns face. Cut a round hole for a mouth. Let the kids play a game to see how many balls they can shoot through the mouth. Let the kids blow bubbles, lots of fun. Make 2 groups and have a 3 legged race. Teach the kids how to juggle. Do you know some one who can read tarot cards? Or just hire someone. Hire a clown for 1-2 hours and let him make a magic show. Hire 1-4 pony's for 1-2 hours. Let the kids make cotton candy, Wal-Mart sells the small cotton candy machines. Finish the party off with a piñata, (clown or hot air balloon). Making clown hats; pin the nose on the clown; draw clown faces on paper plates; musical chairs to circus music. We have lots of yummy Kids Carnival birthday party ideas for food and drinks, have a look below. Clown Face Pizza: Make a clown face pizza with pepperoni eyes, chopped tomato hair and sausage slice mouth. To make this Carnival birthday party cake you need to make a clown shaped cake using a store bought cake pan. Put the clown cake on top of a sheet cake, and fill it with icing. If you want something more fancy ask the local bakery to print and sell you the tranfer paper of a clown face or circus, then you can outline and fill it with icing. Make a 3-tier cake, fill the different layers with chocolate cream, vanilla cream and strawberry cream. Make a tent to go on the very top and put lots of small clowns, elephants, tigers, lions, etc underneath it. Spectacular! Fill the Carnival birthday party bags with balloons formed into animal shapes, hula hoops, whistles, boxes of animal crackers, glow bracelets, circus colouring book that reads "birthday girls name" example Anna's Circus Colouring Book and attached a crayon box to each one. The children are also given the clown hats and clown noses they were given at the start of the party and all of the small candy bags they won as prizes. If you hired a Clown take a picture of each child with the clown and send this picture with a thank you note, that says "Thanks For Coming To My Carnival Birthday Party". If you didn't hire a clown use the clown face picture you took of each child earlier! I hope our party ideas will help you in your planning and I hope your princess will love and enjoy her Carnival birthday party.